Abus GRANIT X Plus 540: The best all-round bike lock? This is one of my favorite bike locks. In fact, I’d go as far to say that its’s the best all-round U-lock available today. It’s a top of the range, standard size U-lock that manages to combine the highest security and build quality with a relatively low weight. And of course it has a price tag reflects this achievement! With a shackle that’s just 13 mm thick, at first glance the X Plus 540 may seem less secure than other U-locks in the same price range. However, the Abus shackle is made from a special type of temper hardened German steel, cast in a patented, parabolic square shape. This makes it as strong as thicker shackles from other manufacturers. So you get the same level of security in a much lighter lock. Indeed, Abus claim it can resist over 13 tons of cutting force which means that no bolt cutter can crop it. And because the shackle is pre-stretched, double bolted and uses a patented power cell locking mechanism, it can also resist 17 tons of pulling force. Plus, don’t forget, the double bolted shackle means that any power tool needs to cut it twice to defeat it! All in all, this means the X Plus 540 is a very secure bicycle lock. Abus themselves give it the maximum 15/15 security rating for bicycles. Sold Secure give a the highest possible Gold security rating. And ART give it a 3/5 stars security rating. In fact, it’s the only 13 mm U-lock to receive three stars from ART. The only other U-locks with three stars are the 14 mm Kryptonite Evolution Series 4 locks. And the only U-locks to surpass it with four stars are the 16 mm Kryptonite New York and the 18 mm Kryptonite New York Fahgettaboudit Mini locks. And all these locks are obviously significantly heavier than the X Plus 540. 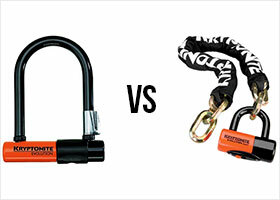 Compare the weights of Sold Secure Gold bike locks here. The GRANIT X Plus 540 weighs 3.20 lb (1.45 kg). That’s about the same as three and a half cans of coke. It’s not light. But it’s certainly not heavy either. 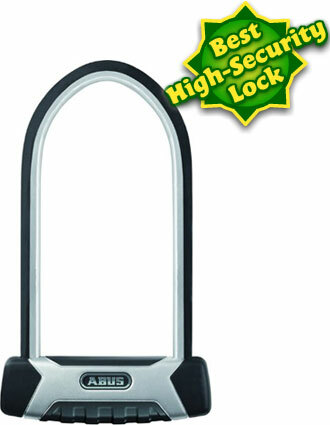 In fact it’s the lightest high security, standard size U-lock available today. Having said that, carrying it around in a bag all day will probably be too much for most people. So what’s the frame mount like? In fact, you can buy the X Plus 540 with two different frame mounts (or with no frame mount at all). So make sure you check what it comes with before you purchase it. The EaZy KF bracket is for frames with diameters 28-36 mm. While the USH 540 bracket is for frames with diameters 15-36 mm. There are a couple of videos (with some pretty serious music) on how to use the EaZy KF and the USH 540. But essentially, the EaZy KF is a smaller mount, into which you clip and unclip the shackle of your lock, while the USH 540 is a much bigger mount into which you actually lock your U-lock. The EaZy KF is more discreet and can be used with one hand. While the USH 540 is much more obtrusive, and while while probably a bit more convoluted to use, it’s also probably a bit more sturdy. However both frame mounts have a much better reputation than the brackets that come with Kryptonite and OnGuard locks. There are far less complaints about Abus brackets. And if you’re someone who depends on decent frame mount then this will obviously be a significant consideration when choosing the best lock for you. The X Plus 540 is 9.0” (23 cm) long and 4.25” (10.8 cm) wide. This is a standard U-lock size and gives a fairly good range of options when you’re looking for places to lock your bike. In fact, it’s slightly wider than many other standard size U-locks. 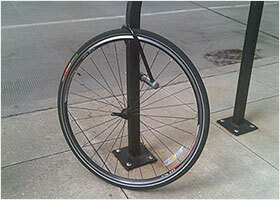 You’re never going to have problems at bike racks, street signs and parking meters. But you still might struggle with thicker lampposts. If you need something longer, the X Plus 540 is also available with a slightly longer, 12.0″ (30 cm) shackle. This could be useful if you’re using it to secure two bicycles. The X Plus 540 comes with two keys, one with a LED light to help you use the lock in the dark. And you also get a code card which enables you to order replacement keys should you lose one. As with all Abus locks, you are able to order your lock “keyed alike” so it matches the keys of another Abus lock you may already own. In this way, you can have one set of keys that open several different locks. The mechanism is protected by an internal dust cover that’s pushed aside by the key when you insert into the key hole. This keeps the mechanism clean and dry without inconveniencing you when you’re using the lock. Abus locks have a very strong reputation for build quality and reliability. The X Plus 540 is no exception and you can really feel that quality when you hold it. Everything clicks together with a very satisfying clunk and it’s a pleasure to use. I think the Abus GRANIT X Plus 540 is probably the best all round U-lock available today. It offers an extremely high level of security. It’s a practical size that gives you loads of options when you’re looking for places to lock your bike. And it achieves both of these things without being prohibitively heavy. In fact, it’s not much heavier than a standard size budget U-lock! Moreover, the fantastic build quality guarantees long term reliability and it comes with a choice from two of the very best frame mounts. There really are no drawbacks to this lock. Except perhaps the price. Often in life, the best stuff costs the most money. And the X Plus 540 is no exception. It’s usually at the very top of the U-lock price range. But what can I say? If you want the very best you need to pay a little more. As I’ve mentioned before, buying a cheap lock is a false economy. 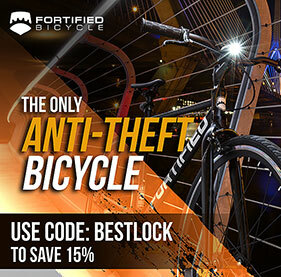 Not only will a decent U-lock save you from having to buy a new bike and another, better lock. But a decent lock, well looked after, will last many years and maybe many bikes. The Kryptonite Evolution Series 4 Standard is very similar to the GRANIT X Plus 540. It’s almost the same size (just 0.5 cm narrower). And in terms of security, it’s also rated Gold by Sold Secure and has 3/5 stars from ART. I don’t think it’s quite as secure as the Abus lock, but it’s getting close. And it’s around 50% cheaper than the X Plus 540! What’s the drawback? Well, the shackle is 14 mm thick, which means it’s a fair bit heavier (8.8 oz / 250 g) than the Abus lock. And the frame mount is nowhere near as good. But if you looking for a U-lock that is the same size and offers almost the same level of security as the X Plus 540, at a fraction of the price, this is a very good choice. Looking for something more secure? 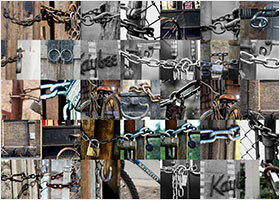 There aren’t many bicycle U-locks that are more secure than the GRANIT X Plus 540. In fact I can only think of two. The Kryptonite New York Standard is one. And the Kryptonite New York Fahgettaboudit Mini is the other. Both of these locks are rated Sold Secure Gold and get 4/5 stars from ART. But the Fahgettaboudit Mini is a very different lock so I wont look at it here. The New York Standard is slightly shorter (2 cm) and narrower (0.5 cm) than the Abus lock but with a 16 mm shackle it’s also considerably heavier (1.1 lb / 520 g). But if you’re looking for something that’s a little more secure than the X Plus 540 while still giving you lots of choice when you’re looking for places to lock your bike, this could be a good option. There aren’t any standard size locks that are lighter than the GRANIT X Plus 540 while still offering a comparable level of security. If you want a lighter lock, you’ll need to go smaller. The Abus U-mini 401 Yellow is also rated Sold Secure Gold. And Abus themselves give it the same 15/15 security rating as the X Plus 540. But it’s much lighter (14 oz / 390 g). Why? Because it’s tiny. Just 5.71″ (14.5 cm) long and 3.15” (8.0 cm) wide. This can really limit your options when you’re looking for somewhere to lock your bike. But depending on where you live, what bike you ride it and you want to lock it, it could work well for you. And if you’re looking for a lighter U-lock than the X Plus 540 that still offers a similar level of security it could be a good choice for you. If none of these options are quite right for you, try my simple 3 step guide that guarantees to find the right lock for you and your bike! How does the mini version of this fare? You mean the Granit X-Plus 54 Mini AKA “The San Francisco Lock”? Yes, I keep meaning to mention this in the main post. It’s essentially identical to the X-Plus 540, but smaller. Apparently it was specifically designed to fit around the parking meters in San Francisco. So it’s a bit wider than other mini U-locks (10.8 cm / 4.25”). For some reason it doesn’t seem as popular as the other Abus mini U-locks. In fact I’m not even sure it’s available in Europe where Abus locks are most common. But just like it’s bigger brother, it’s obviously a fantastic lock. Sold Secure Gold. ART 3 stars. And it only weighs 2.7 pounds / 1.2 Kg. So if you’re in the US and you’re looking for something a little more practical than the standard sized mini- U-locks, this would be a great choice. And I suppose if you live in San Francisco it’s a no-brainer! I’ve also been meaning to ask about the ABUS Granit X Plus Mini 54. I’m in Germany and it’s really hard to find, which I find bizarre. In fact, high-end locks are pretty much nowhere to be found, aside from Amazon. I ended up buying an OnGuard Brute Mini, but really don’t like it all. It takes like 15 tries to get it to lock, which appears to be a schackle alignment issue. I also saw it’s pretty plasticky inside, so I don’t know how it received such high ratings. Maybe the tests are just based on the schackles, so companies can scrimp on the crossbars, it appears. It’s very disappointing and shows the shortcomings of this site’s “review” process, which appears to not really have the products in hand. The OnGuard cross-bar is nearly completely made of plastic. So maybe I’ll look for one of these, since I think the Fahgheddaboudit Mini is a bit too small for my needs. I can also use the Abus Mini in combo with my NY noose- something I can’t do with the OnGuard because the schackle is too thick. Also, the better quality and more secure version of that Abus Mini (the 401) is also practically nowhere to be found in Germany and not to mention, Abus’ pricing here is horrendous for the levels of security. Yes it’s strange. I don’t think the ABUS Granit X Plus Mini 54 is widely available outside the US. I’ve seen it in the UK but it’s not popular. Which is a shame since I think it’s Abus’ best mini u-lock. I have used the OnGuard Brute Mini and didn’t think the crossbar was plasticky. Well, not overly plasticky anyway! You’ve got to remember that the high security OnGuard locks are usually significantly cheaper than the equivalent locks from Abus and Kryptonite. So the build quality is unlikely to be as good. I am going to start adding videos where I actually use the locks I review. You can see my first attempt on my YouTube channel. I’m not really happy with the way that came out though. So i’m working on a better format. Once I come up with something a little more engaging I’ll start adding the videos to the site. Less secure, definitely. Costs much more? Depends where you live I think. Generally it’s a little bit more expensive though. And yes, no lifetime warranty (Kryptonites customer service is the best in the business). At the end of the day it’s all about finding the lock that works best for you. And that’s what this website is trying to help you with. For a lot of people lock weight is really important. And the New York Standard is over a pound heavier than the 540. If weight is unimportant to you then go for the New York Standard for sure! If weight is what you value, buy a folding lock, not a u lock. Just my thought there. Weight equals security. Folding locks are great to transport but if you attack those hinges, they are way to compromise. Those pins are not hardened steel. Overall, a u lock isn’t going to save you weight. You should check out the recent write up on locks on the sweet home website. I thought it was extremely thorough. Folding locks are usually heavier than U-locks that offer comparable levels of security. For example the Abus Bordo 6500 (which is the only Sold Secure Gold rated folding lock) is heavier than the 540. And I think it has the same, (or even less) internal locking space. Also although it’s a Gold rated lock it’s actually significantly less secure than the 540 (2 compared to 3 stars from ART). I think the real advantage of folding locks is the way that their compact folded down form is much easier to transport than a U-lock. 1. I don’t subscribe to the idea that there is one (or two) locks that are the best choice for everyone. Just in terms of security, their number one choice offers only medium levels of protection and is unsuitable for cyclists in big cities. While the number two choice is super secure but perhaps involves many unnecessary compromises (weight, transportation etc) for those cyclists. I think it’s better to think about your own individual circumstances and make an educated choice based on those. 2. They don’t make clear how they tested them for security. For example did they attack the locks on a test bike or in a vice (I suspect the latter). So I instinctively don’t trust these online tests. That’s not to say it’s not a useful article! I think it is. I learned a lot from it. And I’ll be investigating further some of the information in it. I wonder what would happen if some reviewer really put these locks to the test instead of just relying on all the bombastic statements made by their manufacturers. I had purchased this lock, and it was cracked by a gang of little Gypsy children in literally 5 minutes. I don’t know exactly what tools they used for this, but believe me, it can’t have been anything very sophisticated – the lock wasn’t even damaged, just open, and it continued to work normally. Fortunately, my bike was cheaper than the magnificent Abus Granit. Just for you to know that there is a lot of make-believe in the bike lock business. 1. The whole point of this website is that it only recommends locks that have been put to the test. All the locks I recommend have been tested by Sold Secure and/or ART. These are independent organisations whose sole purpose is to scientifically test and rate security devices. And they do a far better job than I could ever do. 2. The Abus Granit X Plus 540 is a very secure lock. This is a fact held up by the ratings that it’s been awarded. Yes there are stronger locks. But for me, this lock offers the best security to weight ratio currently available. 3. That the lock was open and continued to work after your bike was stolen suggests that either it was picked or it was not locked properly when you left it (I’ve done this myself with my sons bike only last month!). People do pick locks. But it’s not a commonly used technique to steal bikes. And it’s difficult. Have a look how long this man takes to pick the X Plus 54, which is the predecessor to the 540. Anyway, however they stole it, you were really unlucky. We all know that no bike lock is undefeatable. All we can do is try to reduce the chances by buying better locks and being careful where we lock our bikes and how long we leave them for. Good luck and I hope you’re still riding! Hi Martin, I did myself a little “research” about the Abus locks with the X Plus cylinder, and it seems that some internet stores sell specialised picking tools for this type of cylinder. This also seems to be in problem in Germany, as there are many negative reviews on Amazon for the Bordo 6500 which uses the same cylinder, they could be openend without any trace given some minutes of time. I also bought the GRANIT X Plus 540 for securing my bike at work, but I am thinking about getting a Trelock or Kryptonite for “street use” because I am afraid there are a lot of guys around using these special picking tools for Abus locks which are very common here in Germany. I have a question. I agree with you this is the best all-round bike lock and I think I will buy it but I have just seen this ” ZEFAL K-TRAZ U14″ lock but couldn’t find many informations about. Can you take a look maybe when you have time? I want to hear your opinion. Thanks in advance, you doing great job. I don’t have any experience of Zefal locks I’m afraid (apart from their wheel locks). It looks OK. But it doesn’t seem to have any independent security ratings. Which for me are the best way to judge a lock. It’s got a 14 mm shackle so you’d imagine that should be enough for low risk area as long you don’t leave your bike for extended periods. But don’t forget usability and the reliability of the mechanism are really important as well. And I don’t have any experience of Zefal locks to give you any feedback there. I’m not a specialist but this Zefal locks can be cut with one simple angle grinder (it’s a round iron bar), with the abus 540 you need 2 cuts with the angle grinder(it’s a square iron bar). This is why I’ll chose the 540. The 540 is just an updated version of the 54. But they’re both great locks. I think most of the changes were cosmetic. So you can buy either with confidence! Hi. Yes I’ve seen that before. I think it stands up very well. Needs 2 cuts and only takes 20 seconds less to defeat than the Kryptonite Fahgettaboudit (which is the most secure bike lock available). Thank you for the fantastic reviews. I was wondering if the 230mm version is quite enough for a mountain bike (hardtail, nothing out of the ordinary, but the tires are of course wider than a city bike), is it worth it to carry around a 300mm one or the 230mm is enough to lock the bike around town? I think you should be OK with the 230 mm if you’re locking the frame and the back wheel. Is the 230mm enough to lock it to an object? Thank you. Yes, 230 mm is standard. Depends what object though!? I bought one of these in June 2017, after my Kryptonite lock was shattered by a thief and my bike was stolen. On another bike this lock was recommended by the bike dealer. It’s now September and the lock doesn’t work anymore. The key turns and allows the bars in but will not turn back to lock the bike. There have been no shocks to the system and no inclement weather. It’s just been a regular summer. DW40 and grease do nothing. In my view this is not the best all around bike lock and not even worth future consideration. It’s a completely subjective statement. All locks buy you time, all can be compromised pretty quickly with an angle grinder. The NY fahgettaboudit will take the most time to get through, has a lifetime warranty, and cost around 30 bucks less than this granit x 540. As Kevy says, we all have different priorities between weight, cost, security, and I liked how you addressed this with the alternative suggestions, good work! Any bike lock can be cut through with a mains powered angle grinder in a matter of seconds. Then what is a point of this site and all locks? (Whit much respects to Your effort and this site). By the way: Is this model secure for freezing, liquid nitrogen? Haha! 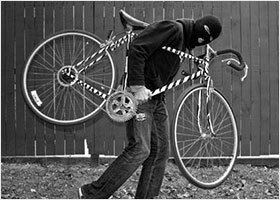 Well the point of this site is to explain exactly that: all locks can be defeated with angle grinders, but not all bike thieves carry angle grinders (in fact only a tiny proportion of thieves do), and the point of a lock is to provide as much protection as possible within that limitation. Different locks are better or worse at dealing with the multitude of other methods that thieves use. And then of course there is the different usability of different locks which is also incredibly important. Yes, this lock is secure against the type of freeing liquid nitrogen attacks it’s likely to be exposed to in the street. Firstly I have to say your work here is outstanding, thank you, but I’m suffering from information overload. The problem I have is I keep changing my mind on which D lock to buy. Balancing security, weight, size & quality seems almost impossible to me. I’m literally changing my mind on a daily basis! Today I’m drawn to the Abus Granit X-Plus 54 Mini. How can I tell if this will be large enough to lock my bike to ‘standard’ UK bike stand posts? I’ve never owned a D lock so have no experience to draw on but I want the lightest, smallest & perceived best Sold Secure Gold D lock available. If you’re just locking your frame yes. If you want to get your wheel inside the lock, it will depend on how big your wheel and tires are and how far they are from your seat tube. It’s a great lock and a really good choice. If it doesn’t fit around your wheel, you could pair it with some Hexlox for very secure all round protection. Thanks so much for your speedy response Carl. My bike is a Giant rapid 2 with (I think) 700C wheels & 25mm tyre width. I like the idea of using Hexlox on the wheels. I guess if the Abus Granit X-Plus 54 Mini fits around my rear wheel, frame & bike stand I’ll only need Hexlox on the front, otherwise on both wheels? If I’m asking dumb questions I apologise. I’m an old duffer & new to cycling plus a little paranoid about having my new bike stolen. Once again, thank you for your time! From the photos of the Giant Rapid 2, I’d say you’d be able to get the Abus Granit X-Plus 54 Mini around the seatpost and the back wheel. For sure you’d only need the Hexlox on the front wheel, but it might be a good idea to do both wheels in case you sometimes can’t get the bike into a favourable position (in this case you could just lock the frame, knowing that the rear wheel is still protected). Hi Carl, I can’t thank you enough for taking the time to respond and your advice. I’ve pulled the trigger and ordered the Abus Granit X-Plus 54 Mini. I’ll also order a pair of Hexlox skewers for my wheels. Cool, I hope it works well for you! Please come back and share your experiences after you’ve used it for a few months. I think this combination is pretty much the ultimate in terms of the balance of security, portability and usability for urban cyclists. I’d be happy to give you some feedback on how I get on with these. I’m really looking forward to fitting & using these theft deterrents, After your help it’s the least I can do!